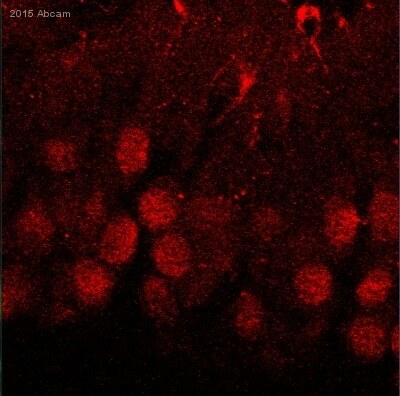 Recombinant fragment corresponding to Human Actin Regulatory Protein CAPG/MCP aa 157-333. A549, HeLa, HepG2, HCT116 and NIH 3T3 whole cell lysates; HeLa cells; Human NCIN87 xenograft tissue. Our Abpromise guarantee covers the use of ab155688 in the following tested applications. WB 1/500 - 1/3000. Predicted molecular weight: 38 kDa. 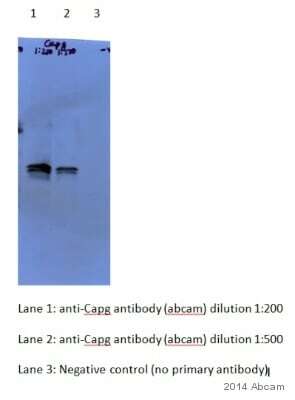 Immunofluorescent analysis of paraformaldehyde-fixed HeLa cells labeling Actin Regulatory Protein CAPG/MCP with ab155688 at 1/200 dilution. Lower image shows cells co-stained with Hoechst 33342. Immunohistochemical analysis of paraffin-embedded Human NCIN87 xenograft tissue labeling Actin Regulatory Protein CAPG/MCP with ab155688 at 1/500 dilution. Publishing research using ab155688? Please let us know so that we can cite the reference in this datasheet.